Many of us think that snacking between meals is a bad habit that should be avoided. But it depends on the snack! If you choose wisely, satisfying hunger between meals can actually be a healthy practice, and not one to feel guilty about. 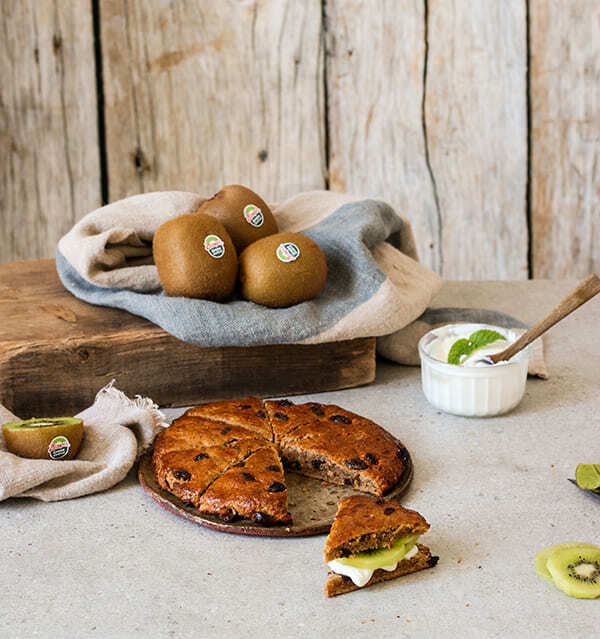 And since the delicious and nutritious Zespri kiwifruit is a healthy snacker’s best friend, below you’ll find four fantastic recipes that will keep those hunger pangs at bay and fill you with vitality. Guilt-free snacking! A slice or two of toast is a tempting snack in the afternoon, especially when the kids come home from school. The trick is to ensure that the toppings are not too heavy. Instead of butter or chocolate spread, why not offer hungry children a tasty and nutritious option. 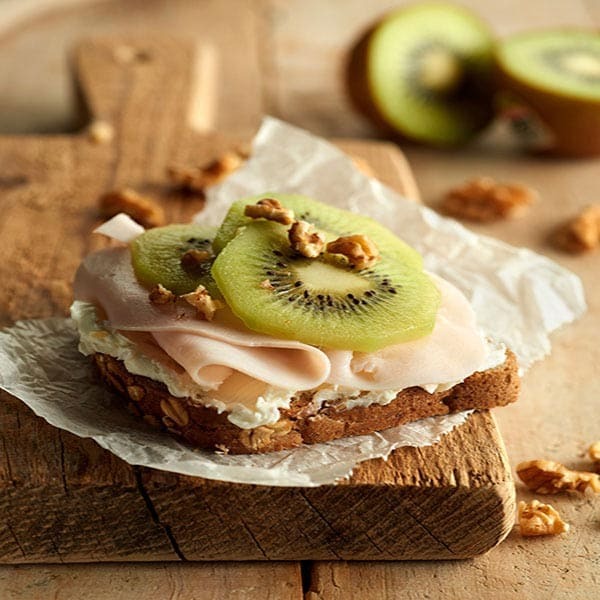 Use wholemeal bread for extra fibre, and add kiwifruit, ricotta and turkey for a satisfying taste explosion. If you like your snacks to be colourful and exciting, then we’ve got the perfect recipe for you. 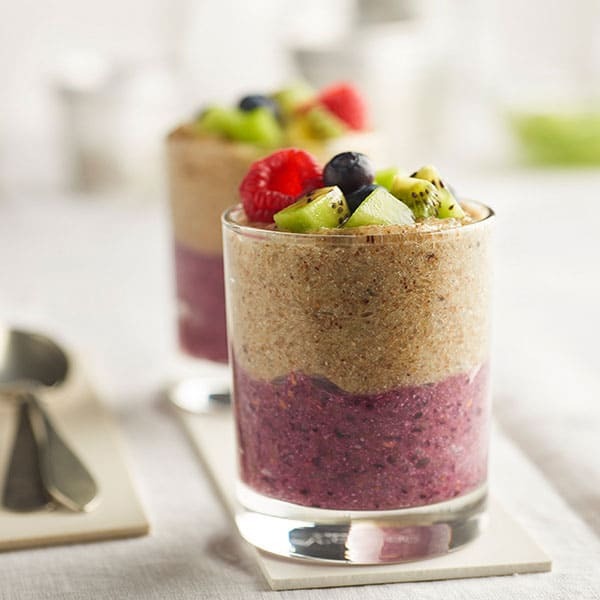 Not only do kiwifruit and berries make for a great taste combination, but the contrast of green and red creates an eye-catching dish that will inject a sparkle into any mid-morning or afternoon vitality slump. Snacking is especially important for those of us with hectic timetables. It isn't always possible to make time for a proper breakfast or lunch, yet if we want to perform our best, we need to ensure our bodies are properly fuelled. 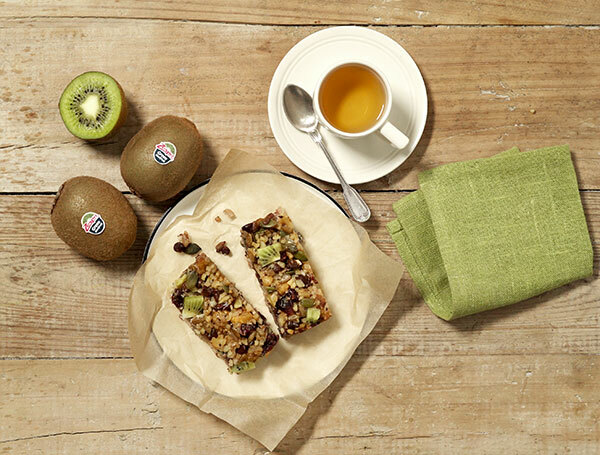 These versatile kiwifruit energy bars can be eaten anywhere and everywhere: why not pop one in your children’s lunchbox, or keep a couple in your desk drawer at work? Sometimes our snack cravings come from a desire for something comforting. If this sounds like you, then why not replace that tempting chocolate bar with a nutritious alternative? These delicious scones are soft and satisfying, especially when still warm from the oven. Filled with fresh banana and kiwifruit, they are also packed full of nutrients – not every comforting snack can say the same! If you find you can’t resist that mid-morning or afternoon biscuit with your cuppa, here's a simple, naturally sweet snack that is low in fat and light on added sugar.